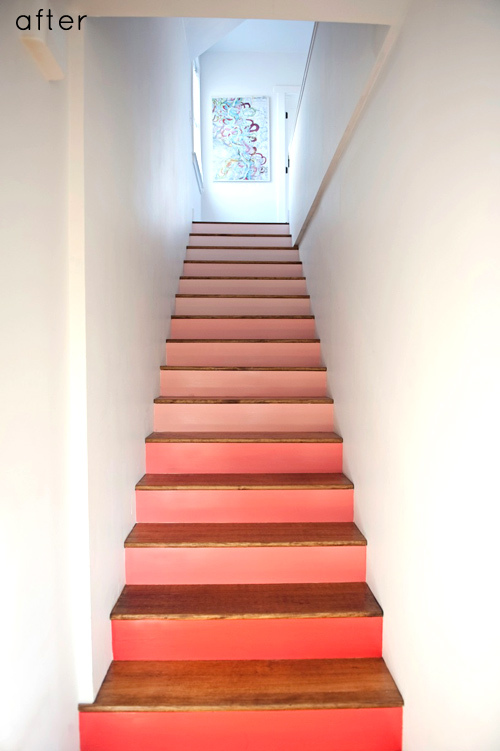 Painted staircases are everywhere right now, and I just had to share a few of them with you. This design trend is so versatile, offering an option for every – and I mean every – decor. It’s a super-inexpensive way to upgrade a tired, drab staircase and make it into a true focal point. Check it out! This stair features chalkboard paint on the risers, giving the homowners – or their kiddos – a chance to change the look of their staircase on a whim. 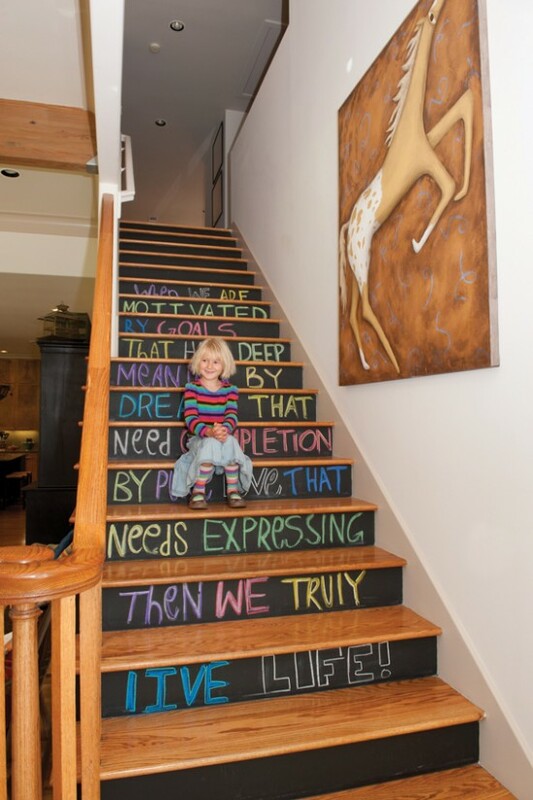 Drawings or inspirational quotes would be a great way to brighten the stairs. 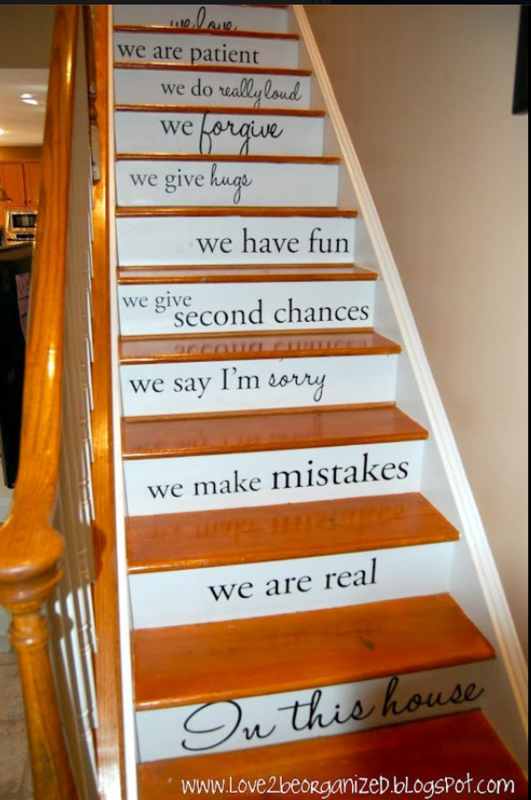 I love the idea of adding your own family values to the stairway, like they did on this one. How about this whimsical paint job? Who could be unhappy looking at that little ray of sunshine? 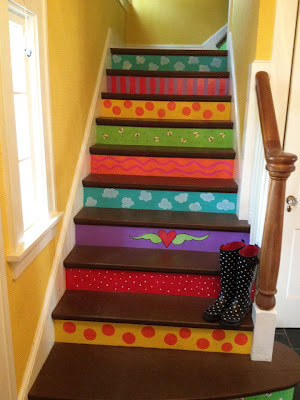 There are a few things to keep in mind if you are thinking about painting your own staircase. First, hardwood risers and treads work best – particle board will not paint smoothly or hold up long-term. Secondly, proper preparation is key! Be sure to take the time to fill holes, sand things smooth, prime and paint the right way. This will be a highly-traveled area in your home, and you don’t want it destroyed due to a poor prep job. Which brings me to another point: painted stair treads will take a lot of abuse, and they may need to be touched-up periodically. Using a high-quality paint intended for use on floors or porches will help reduce wear. 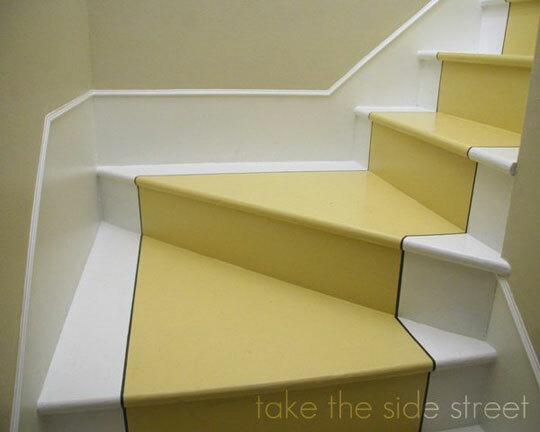 You can also choose to keep the treads as stained wood, painting just the risers. The wood will hide scratches and hold up to wear longer than a painted surface would. And, bare stairs can be slippery, so be careful in home with small children or elderly folks. I’m hoping my husband may let me give this a whirl sometime…anything would have to be better than the carpet we currently have which has. to. go. 🙂 What do you think? Would you try this trend in your home?